The 2018 BMW X2 is a sporty version of the X1 subcompact SUV. With a lowered roofline, sportier styling, and surprisingly sharp handling, the X2 is fun, good looking, and relatively affordable. In either front- or all-wheel drive, the X2 costs a bit more than the X1 and many of its competitors, but occupies a uniquely sporty niche. If you've been looking for a European luxury crossover SUV you can afford, but one that still offers the kind of sporty flair and driving sophistication to match, this may be what you've been waiting for. If you need a bigger back seat, a compact SUV like the BMW X3 or Mercedes-Benz GLC-Class may be a better choice. If you're OK with the size but want more performance, the Mercedes-AMG GLA 45 will deliver. However, both alternatives cost more money. The 2018 BMW X2 is an all-new model, but with some familiar hardware since it's based on the BMW X1. However, the styling is all new, the mission is different from the X1, and there's never been a BMW X2 before. The 2018 X2 shares its dash, center console, iDrive display, and switchgear with the more upright X1. The biggest difference is room. While front-seat passengers are perfectly comfortable, the rear seat suffers in leg room and especially head room. If there's a tall driver, make sure the shortest passenger is behind. However, it's not worse than other subcompact crossovers like the Mercedes GLA. There's decent cargo space with extra storage space under a floor panel. Overall, it's comfortable and quiet for the class, but rear visibility is severely compromised, so you'll make good use of the parking sensors and backup camera, but note that blind-spot warning isn't available. One last quibble: The wireless charging pad in the center armrest is exactly too small for large-size smartphones. Even-numbered BMW X-cars are generally the sporty version of the one-lower odd numbered model, e.g., X3/X4 and X5/X6. However, we're liking the looks of this new BMW X2 more than the others, and it's probably because the X2 doesn't share the sloping hatch design of the X4 and X6. Instead, it's boasting just enough styling flourishes to capture your attention without making you wonder what they were thinking. We already mentioned the BMW logo on the C-pillar, but also take note of the reshaped "kidney" grille in front. Surprisingly, our first time behind the wheel of the BMW X2 was on a racetrack. This seems like an odd place to get one's first experience with a subcompact luxury SUV, but the 2018 BMW X2 puts an emphasis on its handling and performance. So, maybe not so surprisingly, it proved perfectly satisfying. The little BMW SUV boasts sharp steering, good power, and makes the most of its all-wheel-drive setup as it powers out of turns and down straightaways. Yet this doesn't mean it's brutal on the streets. Instead, the new X2 is as comfortable and composed on surface streets as you'd hope. The engine's 258 lb-ft of torque is available from a very low 1,450 rpm, meaning the X2 feels exceptionally responsive in traffic and when passing. The suspension that feels so adept on the track in Sport mode is perfectly comfortable and accommodating in Comfort on the street. The base Manufacturer's Suggested Retail Price for a 2018 BMW X2 sDrive28i is about $37,400, including the $995 destination charge. All-wheel drive will add $2,000 to that price, and we think it's worth it. If you opt for the sportier M Sport X version, prices start at just over $42,000, although you get quite a bit more equipment. If you go nuts with the options you can push the price to well over $53,000, which is more expensive than many of its competitors. However, you can keep the price in a more reasonable mid-$40,000 range and still get a lot of cool stuff. Generally, the BMW X2 is a little more expensive than the Mercedes-Benz GLA 250, Audi A3, Infiniti QX30, and Lexus NX 300, none of which have the sporty leanings of this model. Be sure to check the KBB.com Fair Purchase Price to see what others are paying in your area. As for resale value, the X2 is far too new to make an estimate. The base model 2018 BMW X2 sDrive28i comes with front-wheel drive and an 8-speed automatic transmission. Inside, there's a 10-way power driver's seat with power side bolsters, faux-leather upholstery, an audio system with iDrive, Bluetooth, USB, and Aux inputs, and a touch-screen/knob-based control system. Automatic climate control is also standard, along with rain-sensing windshield wipers, push-button start, and a power tailgate. In addition to multiple airbags and stability control, the X2 comes standard with a rearview camera, exceptionally useful considering the pinched rear view. All-wheel drive is available on all models, and worth the $2,000 for it. Besides that, the X2 gets divided into two levels: standard design and M Sport X Design, the latter giving it a more aggressive appearance and including the standard model's Convenience Tier option package, which adds power-folding outside mirrors, auto-dimming rearview mirror, keyless entry, and a panoramic sunroof among other things. The Premium tier on both standard and M Sport adds a head-up display, navigation with real-time traffic info, heated front seats and steering wheel, and BMW's remote services. Other options include any color other than white or black, leather upholstery, wireless charging and a Wi-Fi hotspot, an upgraded Harman Kardon audio system, Apple CarPlay, parking sensors, and active cruise control with stop and go. The 2018 BMW X2 shape manages to combine sleek lines and the promise of utility without unnecessary bulk or the weird roofline of its X4 and X6 cousins. Of special note: This is the first time the BMW logo has appeared on the rearmost roof pillar since the BMW CSi in the 1970s. With the caveat that anything with a premium European badge is going to be on the pricey side, the 2018 BMW X2 is more affordable than you might think. Prices start at less than $40,000, and a nicely equipped model will come in at about $45,000. Best of all, the X2 feels worth every penny. The 2.0-liter turbocharged 4-cylinder we drove is the only engine you can get in the 2018 BMW X2. Its 228 horsepower and 258 lb-ft of torque feel perfectly stout under the hood, and BMW says whether you choose front or all-wheel drive, the engine hauls the X2 from a standstill to 60 mph in about 6.2 seconds. The transmission is an 8-speed automatic with manual shift control and, we're happy to see, a standard PRNDL shift lever instead of BMW's less intuitive electronic gear selector. The EPA estimates decent fuel economy, up to 31 mpg on the highway, which is good news since BMW recommends premium fuel. The 2018 BMW X2 is a sporty alternative to the BMW X1 SUV. Using the same basic mechanical underpinnings -- including the same 2.0-liter turbocharged 4-cylinder, 8-speed automatic and available all-wheel drive -- the X2 adds a sporty flair to the mix. With unique styling and an emphasis on driving entertainment over utility, the X2 is poised to take on other subcompact utilities, like the Audi Q3, Mercedes-Benz GLA-Class, and the Infiniti QX30. But we think this is the best variation on the formula so far. The sharp looks make promises that the X2 easily keeps, and even the price is reasonable, at least for a European luxury brand. While something like the Mercedes-AMG GLA 45 is undoubtedly quicker, the X2 is fun, good looking, and less expensive. 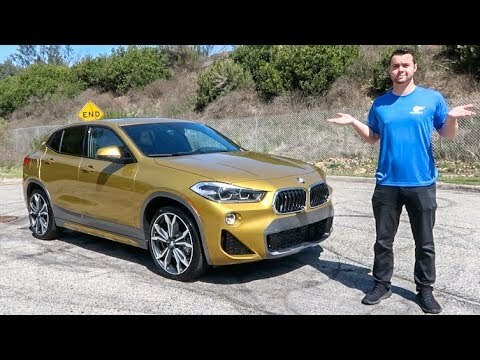 2018 BMW X2 Review - Is It ACTUALLY Any Good? Very beautiful car. 100% worth. I don't really like the car, fails a lot, pretty bad, do not recommend the BMW vehicle, do not buy this, please don't buy it, don't buy it, don't buy it, don't buy it, don't buy it, don't buy it, just kidding, buy it, it is amazing lol. It is one of the best cars I've ever owned before. Drives like a car but looks like a wagon, great gas mileage and pick up. No complaints, love this model and it is handling as well as all the bells and whistles. It is reliable and comfortable, especially love the heated steering wheel, seats and the large sunroof that provides natural light. The added bonus is the trunk opening with no touch and extra room. Thoughtful design and quality built to perform day in and day out. Awesome vehicle. Great performance and looks. I always feel very safe in this vehicle because of its construction.